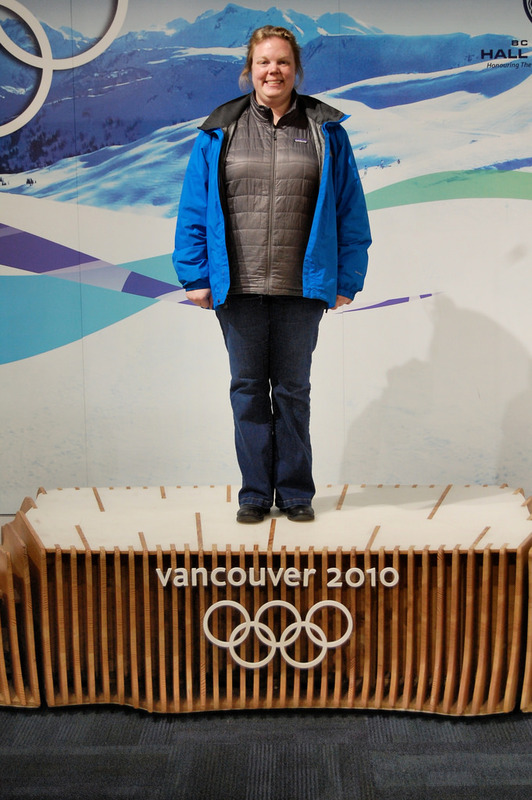 The last time I was in Vancouver was for the 2010 Olympics. Although it is still a decent size city, 2.4 million including the suburbs, I was interested to see the city without the obscene amount of extra people walking around. Our time at the Olympics was short, a mere 1.5 days, and my friend Jen and I did not plan our time there very well. To put it mildly we wasted a lot of time waiting in line to see the Olympic medals up close at the Royal Canadian Mint. We stood in line both days for hours on end and never got to see the medals. We had to step out of line both times to rush off to one of our events. Four years later it was now time to rectify that by visiting the BC Sports Hall of Fame and Museum. I did not go in with high expectations. This was mostly because I visited the International Swimming Hall of Fame in Fort Lauderdale a few years ago and realizing that no matter how much I loved the sport of swimming, nothing could make that an overly impressive experience. I did hope that the BC Sports Hall of Fame would not be a let down but knew there could be a possibility. My dad and I hopped on the skytrain from downtown and arrived at BC Place. The arena houses the BC Sports Hall of Fame and was the location of the Opening and Closing Ceremonies for both the 2010 Olympics and 2010 Paralympic Winter Games. We entered the museum and paid the $15 CAD entrance fee for a self-guided tour. Located near the entrance was what I had come to see. 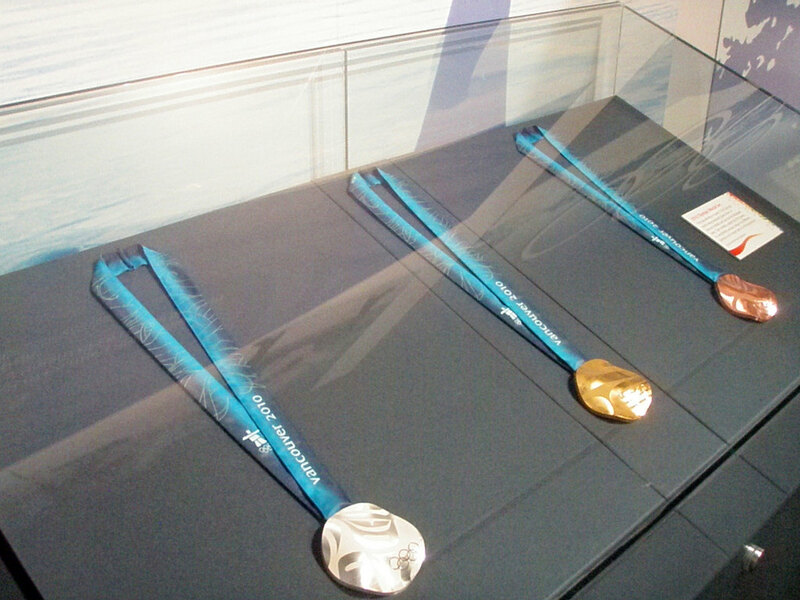 There they lay in a glass case, the 2010 Olympic bronze, silver and gold medals. In hindsight I would not have wasted as much time in line waiting to see them if I knew it was going to be this easy to see them in the future (and with no line this time). 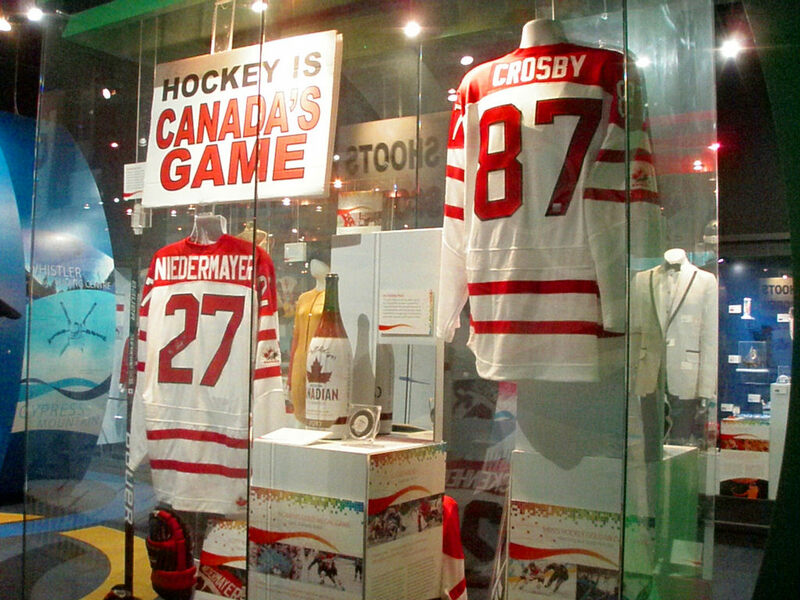 We also found several displays on the 2010 Olympics as well as Team Canada jerseys from Crosby and Niedermayer, which was a real treat to see. 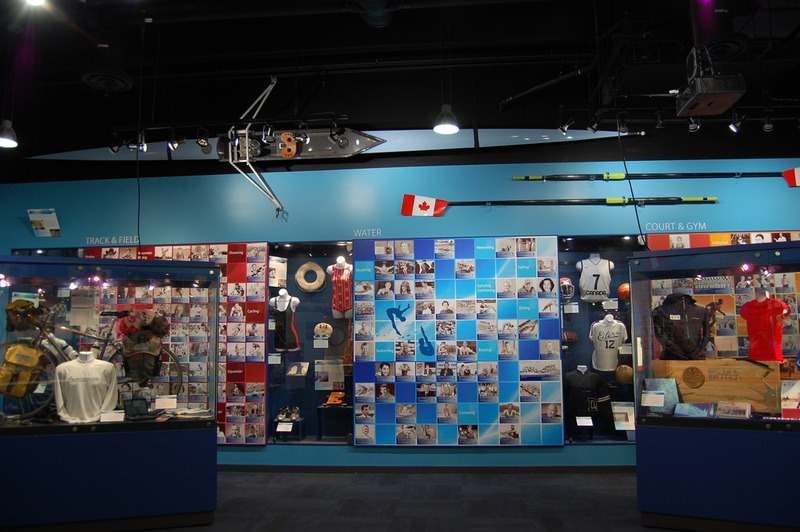 The museum was split in to two sections, the Olympic side and the British Columbia athletes who have been inducted to the BC Hall of Fame. It is important to note that the athletes represented here are from the Province of British Columbia, not the entire country of Canada. 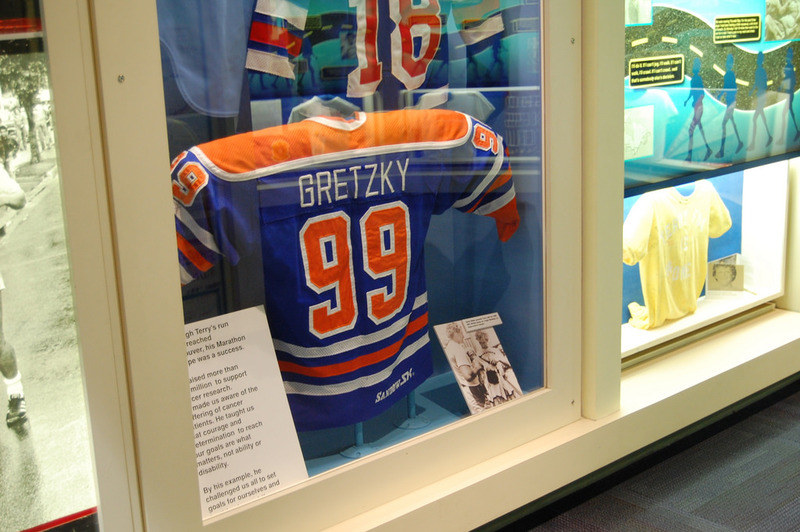 I did not know that until after I left the museum wondering how the hell you could have a museum about Canadian Athletes and not include the greatest hockey player in the world, who just so happens to also be Canadian. We did get to see one of his Oilers jerseys however. Another highlight for me was seeing the Montreal Jersey of Carey Price. Price is Montreal’s giant 6’3”goaltender that I use to watch play in the junior hockey league against my local junior hockey team. Although he was on the opposing team you respected just how great he is at the sport – and his team rarely lost with Price between the pipes. 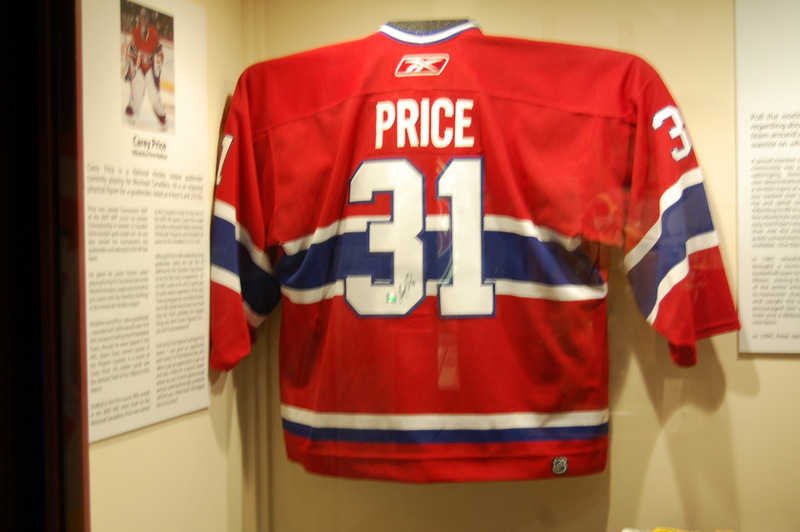 Price was first drafted in 2005 and later joined Montreal in 2007 as the backup goaltender, only to become their starting goaltender later that season. Pretty impressive for a rookie if you ask me, but proves just how good Price is. After absorbing all the hockey and Olympics memorabilia I could, it was now time to get down to business. Auto racing. There is even an arcade style racing game to try your hand at driving a CART car. I of course took the wheel and soon found out that I was not cut out for driving a car that fast. Let’s just say I spent a lot of time stuck in the infield’s grass. Kind of like Danica Patrick does. We finished up our tour of the museum and I left content with what I had seen, unlike my visit to the International Swimming Hall of Fame. 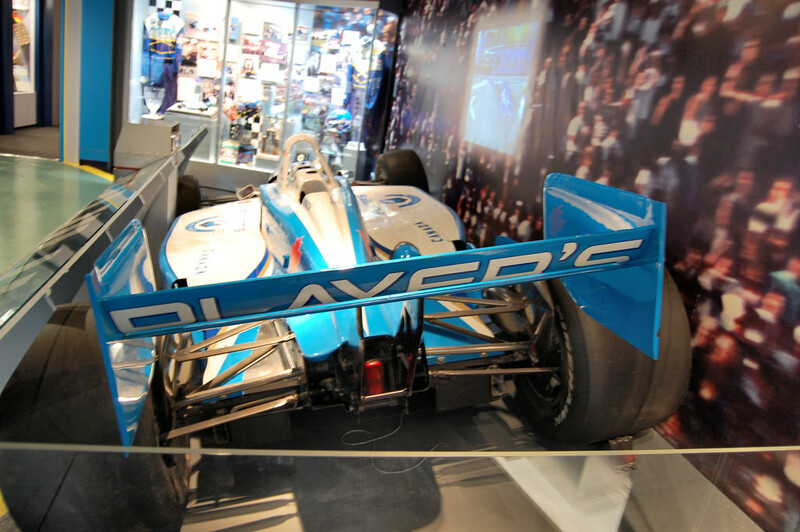 The museum was comprehensive of multiple sports and paid great respect to the athletes and the 2010 Olympics. I do have to say this was probably my favorite part of the tour, standing on the podium. Now if I could have just gotten my hands on one of those gold medals to wear for this photo my 4th grade dreams of winning a gold medal for downhill skiing would have looked complete! The BC Sports Hall of Fame is located in BC Place Gate A at 777 Pacific Blvd South in Vancouver. The museum is easily accessible by the Skytrain. The museum is open 7 days a week from 10am to 5pm. Admission is $15 CAD for adults, $12 CAD for seniors, youth and students. Kids 5 and under are free. They also offer an All Access Experience tour that takes you to the locker rooms, media lounge and access to the field of BC Place for $20 CAD. Want to check out more exciting things to do in Vancouver during the winter months? Check out British Columbia Magazine’s 99 Things To Do In Vancouver In The Winter. WE this and We that. Who was your mysterious companion? you are the we. Or I could be referring to my alternate personality. I’m not sure……………..